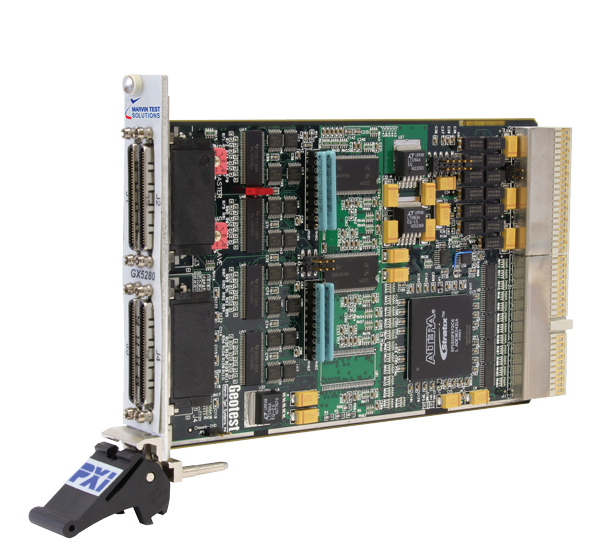 PXI Digital I/O Card, Dynamically Controlled - GX5280 | Marvin Test Solutions, Inc. The GX5280 Series are high performance, cost-effective 3U PXI dynamic digital I/O boards with 32 TTL input or output channels and 32 LVDS input or output channels. The GX5280 Series offers an industry leading 512 MB of on-board memory and supports test rates up to 200 MHz. The single board design supports both master and slave functionality without the use of add-on modules. The GX5280 Series supports selectable I/O levels of 1.5 V, 1.8 V, 2.5 V, 3.3 V, or 5 V (TTL, LVTTL, CMOS, LVCMOS). In addition, the GX5282 and GX5283 also support 32 differential channels for LVDS, M-LVDS, or LVDM logic families. The TTL / LVTTL interface utilizes a programmable voltage source which sets the output logic levels from 1.4 V to 3.6 V. Programmable thresholds of 1.5 V, 1.8 V, 2.5 V or 3.3 V (5 V compatible) are supported for input signals. Recommended operating input voltage range is from 0 V to 5.5 V. The GX5282 and GX5283 can operate as stand-alone cards or with up to seven additional slave boards, providing a total of 256 synchronous channels. A windowing method is utilized for PCI memory accesses to limit the required PCI memory space for each board to only 16 MB, thus preserving test system resources. A direct mode, for continuous data transfer between the test system controller and the I/O pins of the GX5280 series board is also supported. Data direction is bi-directional, with direction configured on a per byte basis. Individual channel output enable control is also supported. The GX5281 provides 128 MB of total memory with 32 Mb per channel while the GX5282 provides 256 MB of total memory with 64 Mb per channel. The GX5283 has 512 MB of total memory. Programmable I/O width allows trading vector width for vector depth. The GX5283 supports 128 Mb per channel when in 32 channel configuration, and is programmable down to a width of 1 channel with a depth of 4 GB. Widths of 32, 16, 8, 4, 2 and 1 channel(s) are supported. All GX5280 Series boards provide programmable TTL / LVTTL output clocks and strobes, and support external clock and strobe. Programmable PLL’s (phase locked loop) provide configurable clock frequencies and delays. The GX5283 additionally provides a LVDS output clock. All GX5280 Series boards can halt or pause on a defined address or loop through the entire memory. The GX5283 can loop on a defined address or through a defined block of memory.